Although we don’t pretend to have all the answers – who would believe us – we just may have hit on a genius idea that can cure two ills with one shot: defuse the Ukraine crisis and find a true leader and hockey genius both strong and smart enough to replace George McPhee. Caps fans, we give you next General Manager: Vladimir Vladimirovitch “Pootie” Putin. 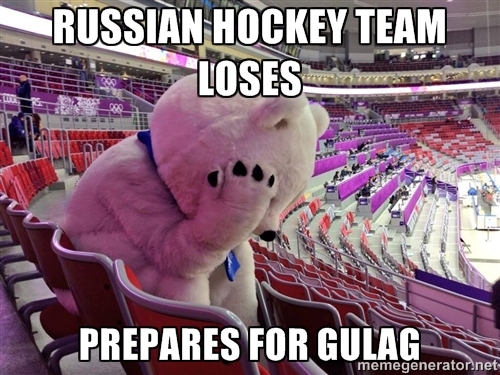 Despite Team Russia foundering in Sochi, this guy knows hockey, amirite? Yeah sure, to the suits at Monumental this idea could go over worse than a bearded Austrian transvestite at a European talent contest. Oh, wait. Scene: Office interior. Nighttime. Rain on windows. Figure with his back to camera sitting behind desk empty of clutter except for a phone. Slow push in. Close up of phone, which starts to ring. Leonsis’ hand picks up receiver. Cut to seated figure, back still to camera. Putin: Ted! Is I, great czar leader of glorious Russian empire Vladimir Putin! We talking now to make the new job of conqueror of Capitalist American hockey, yes? Ha! Get joke? Is funny, da? I am funny. Ted: Capitalist…right. Uh, the position of general manager, yes, that’s the one. Ted: Uh, well we need to discuss a number of issues first. Putin: Haha, yes, I get. We do for propaganda. I am wink at you through phone now. Ted: Mmm…ok. Vladimir, the most important thing right off is for you to understand what this team means to this town. I may own the Caps, but really, I’m just the caretaker for a true Washington treasure, safe-guarding this organization for future generations. Putin: Like I am guard the many Russians around the world! Is job for manly men, yes? Do not worry, corporatist dog friend. I protect good your little Caps. Ted: That’s fine, with the…protecting, and all. Um, how about we talk hockey for a few minutes. Describe for me the style of play you would bring that would best serve a Capitals run for the Cup. Putin: I get down on ice and play! That best! Is no joke, you see me other day? We play Russian stars, and I still score first goal! 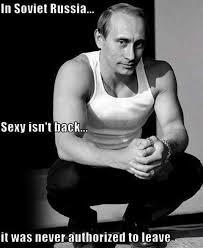 Everything better with Vladimir! But I guess that not fair for dainty NHL for me to play, so I manage. Haha. Ted: (pause) Yes…manage. How would you manage? Putin: Manage like manage people’s paradise of Russia! How argue with success? Cheering masses in streets now require almost no beating to make praise to Vladimir! I telling you now my secret: prison. Friends who don’t argue with Vladimir, they get dacha and mistress and maybe toilet paper. Those who argue, into jail. Coach who not play Ovi, Zenya and Dima every game? Jail! Slapshot puppet not get fans to Rocking Red? Jail! Hot dog stand run out of mustard? More jail! Ted: Alright, alright. Now Vlad – may I call you Vlad? Putin: Sure! 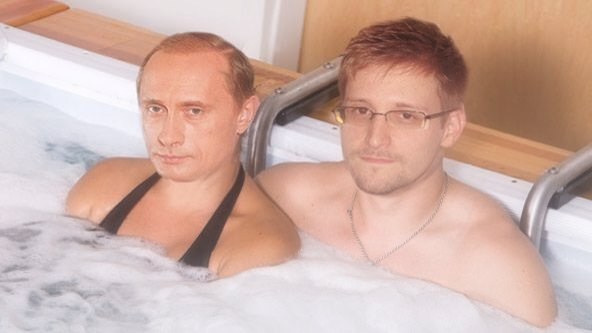 Just not call me what Snowden call your president. Ted: So Vlad, other than the playoffs, there’s no other team more important for us to beat than the Pittsburgh Penguins. Lately they’ve been getting the better of us. How would you fix that? Putin: I tell team to win. I yell first in Russian, then I tell very quiet in English. Don’t worry, my English very. I tell them quiet and slow and squint eyes like this, just like I do with your Bush when he see my soul. Ha. Work every time. Like hypnotist. Maybe I am new Rasputin, no? I squinting now at you…is working? 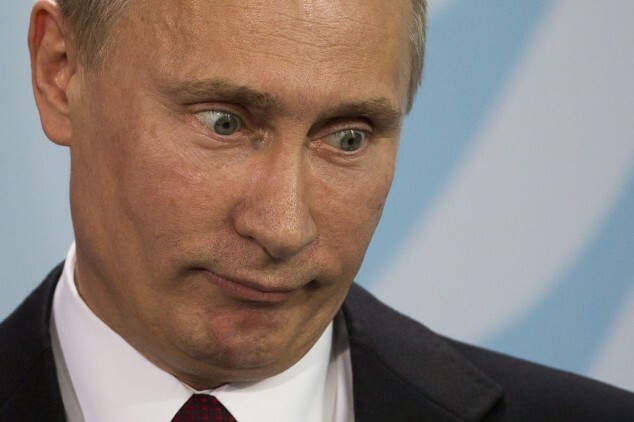 Putin: Squint not work, I squirt, like King Henrik. Crosby little, little crying man. Then next best thing. I hire thugs to…well, in fact, I hire thugs anyway. If all that not work, I annex Beaver Falls. Don’t tell me you didn’t think this was the thing. Putin: Yes. We fix that. Ted: Uh, no actually we don’t want to fix it. If anything we want to improve it. I’m curious: do you have any thoughts about making the NHL more inclusive? Maybe you’ve heard about the You Can Play project? Putin: Yes. In Russia, we call it “You Will Quiet.” If not that, we like “Cossack Thrash” program, where we go beat young women with the homosexualism. Is good. Never fail. Ted: Yeah. Uh, Vlad, I’m sensing a pretty big gulf between what we need and what you want to..
Putin: Quiet, decadent leech! Vladimir say and you obey! I take job now and you step down! Prepare great celebration for my taking of the manager. Tell Swedes on team they better step up and choose sides! Is done! Scene: Leonsis swivels in chair to camera. Cut to hard rain falling. Sound of Putin on phone cuts off. Close up: hand puts phone on receiver as audio cuts off. Quiet. Figure in chair rotates back to window, away from camera. Rain continues to fall. This entry was posted in Washington Capitals and tagged film script, is funny no?, new GM, Ted Leonsis, Vladimir Putin. Bookmark the permalink.